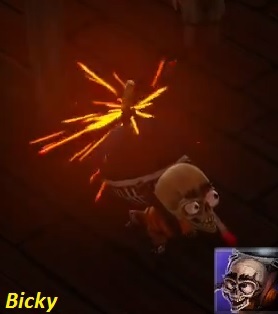 Bicky the Bomber is a Side Quest in Divinity: Original Sin Enhanced Edition. This quest is triggered when you open the door to the first bedroom upstairs in Silverglen Inn/ Pickaxe Tavern. This quest begins when you walk into the door of the first bedroom on the upper floor in Silverglen Inn. When you open the door Bicky warns you to stay away. You can either try to calm him (+1 Cautious) down or call his threat a bluff (+1 Bold). To rescue Bonnie, you cannot move at all after entering the room. Taking a single step in any direction will make Bicky explode and result in -1 Reputation. You will have to use magic or ranged attacks to quickly control the situation. You can use freezing arrows or spells. You can use a Teleportation skill to teleport Bicky away from Bonnie and your party. You can even cast Rain with Jahan to make the fuse go out so he can no longer explode. Speak with Bonnie afterwards to know what happened. She will tell you that a guy named Frederick might be behind this(You will meet him in Frederick's Blood Stone quest). This completes the quest. That feel when you reposition yourself to get line of sight for a spell and Jahan bursts through the doorway like SWAT raiding a weed dispensary... Except this ended with burning flesh, not burning hash.